Nearly two years ago, I stumbled across a pair of Martin Brodeur model goalie gloves (blocker and catcher) at a Play It Again Sports in Plaistow, N.H. This morning, I had one of the game's best goalies sign the catcher. 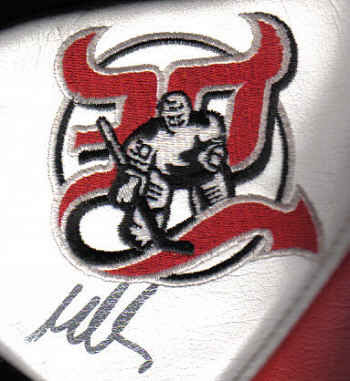 For the record, that silver scribble is what Brodeur is signing these days. A couple of seasons ago, it used to be a "MB." Still, I won't complain. Of all the NHL stars, Brodeur is one of the most consistent signers. He'll sign anything put in front of him (cards, pictures, pucks, jerseys, mini-jerseys, masks, etc. ), but he'll sign only one per person. Again, I won't complain. And seeing that I only got four autographs, but three pucks, out of the Devils (the Westin Harbour Island hotel has pushed us away from the entrance and very few players honored our requests), this certainly was the highlight. How do you spell collapse?